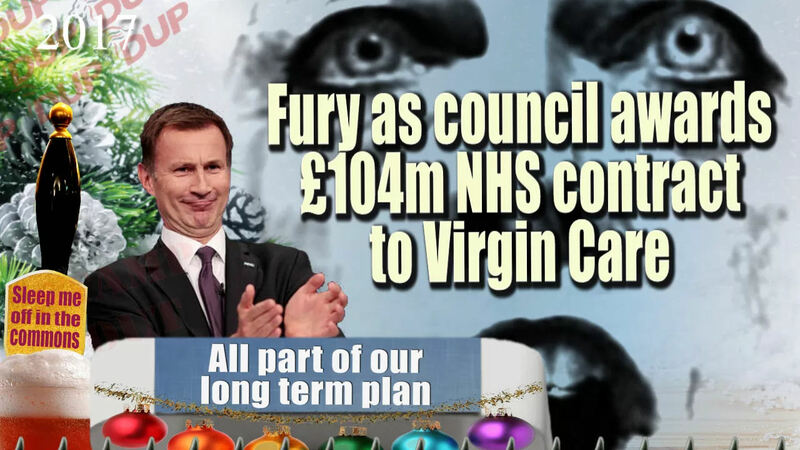 Lancashire county council’s award of a £104m contract to Virgin Care would “significantly” undermine the incumbent NHS trusts’ ability to maintain other services, a judge has said. HSJ brief header... We've been saying this all along, and its no different to when a hospital trust loses one its services to the private sector - for example the urgent care and other contracts. ■ A hospital trust losing a service to a non-NHS provider significantly undermines the trusts’ ability to maintain its other services (such as A&E). So based on the judges opinion of the social care children's contract, each time the CCG award an NHS contract to a non-NHS provider the NHS sinks deeper and deeper into debt. This begs the question of WHY Lancashire Teaching hospitals NHS foundation Trust aren't opposing the STP plans to close many of its services and transfer them out-of-hospital into to the community where they will be taken over by the private sector. The trust cannot afford to continue running these services in-house and at the same time attempting to make efficiency savings so they'll be relieved to hand over our NHS to "any qualified provider" as per the H&SC act 2012. This is why the Hospital Trusts in-house services for maintenance, buildings etc are proposed to be handed to a subsidiary company wholly owned by the trust as shareholders. It's not looking good is it? It needs resistance from every public sector worker and everyone in the community to stop this rot before our NHS is ripped out of our grasp before our very eyes. Let's clarify one or two things since there still appears to be some misconception about what's happening with Clinical Commissioning Groups (CCGs) and rationing of medicines and procedures. Consider this: No GP writes out a prescription for 37p worth of paracetamol. The mild pain killers are usually prescribed in bulk boxes of 100 and included with other items for patients with long-term conditions such as COPD, MS. fibromyalgia etc. Also, when boxes of paracetamol are written on prescription they do not cost the NHS £8.60 (a box of 100 is around £1.67 and the practice claims back the difference). Patients who pay for paracetamol are unlikely to be written a prescription and the number of GPs who prescribe paracetamol is very small, with the exception as in bulk for chronic long term conditions where paracetamol is preferable to a stronger prescription only pain killer such as Tramadol. It's penny pinching, and the reason behind the rationing of medicines and treatment is to 'familiarise' patients with 'paying for treatment and drugs'. This is part of the overall strategy for Lancashire & South Cumbria 'Sustainability & Transformation Partnership' (STP) where all healthcare providers have been told to make 'efficiency savings' (i.e. make cuts). This is so healthcare providers can access 'transformation funding' to enable the roll-out of American Style private public partnerships called 'Accountable Care Systems' (ACS). .*Also known as Accountable Care Organisations (ACO). An Accountable Care System (ACS) relies heavily on reducing 'patient demand' on services such as hospital admissions and GP attendances along with rationing procedures such as hip and knee operations* and cutting back on entitlements for medication and treatment. *Rationing paracetamol is only the start. For example, in January, three clinical commissioning groups (CCGs) in the West Midlands proposed reducing the number of people who qualify for hip replacements by 12%, and knee replacements by 19%. To qualify under the proposed rules, patients would need to have such severe levels of pain that they could not sleep or carry out daily tasks. In the United States the health insurance industry call this 'demand management'. The NHS currently has a fixed tariff payment per treatment (payment by results) but with an Accountable Care System this changes to a fixed budget payment per person (capitated payment). The incentive then becomes more financial and partners in the ACS will start to 'cherry pick' the most lucrative high-turnover procedures/treatment and introduce a more demanding rationing system. Whilst people are arguing over who pays for a packet of paracetamol, the CCGs are working on policies to actually STOP you accessing NHS services in a timely manner and prioritising those who can pay for those services, i.e. the profitable element comes first. Many poorer in society will go to the back of the queue and be classed as low priority by the ACS (they undertake a risk assessment and categorise all patient records registered with a GP Practice). In the U.S.A the scheme is called Medicaid and is a 'two-tier' system where those who can't afford healthcare are only entitled to certain services, and only then if they setup a healthcare plan with their providers [an ACS might call this a 'Personal Health Budget']. Now factor in the 'welfare' element and the gradual reduction of benefits to the disabled and families on low income and we have a situation where many people become dependant on household incomes that are on the poverty line. This means they may have to choose between paracetamol and a meal, just as we have now with foodbanks. Mark my words, if the ACS systems are rolled out here in England you won't be arguing over a packet of paracetamol, you'll be fighting for access to life-saving treatment that was once free at the point of need on the NHS. It's time to stop this madness before it goes any further. Sustainability and Transformation Plans are now STP Partnerships and are turning into Accountable Care Systems. Local Authority Health Scrutiny Committees are nodding them through without any objections. Councillors don't seem to know what Accountable Care Systems are or realise how they will dismantle our NHS. In 2012 the way the NHS operates was re-written by a Conservative led government via the Health & Social Care (H&SC) bill. The bill received royal assent and became an 'act' which came into effect in April 2013. The act guaranteed the King's Fund further research funding. In 2014 the King's Fund published its Interim Report on the "Future of Health and Social Care in England" - 86 pages setting out what its ‘Independent Commission’ think must happen to save the NHS from becoming 'unaffordable' and 'unsustainable'. 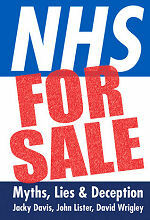 The author, Kate Barker CBE, a business economist, has suggested a range of 'options' to increase income for the NHS. By and large these mean those who use it having to pay more. Yet funding the NHS is about choices not affordability. If we invested a similar proportion of our national wealth as Germany and France do (both around 11.5%) the NHS would have about £25billion more than it does now. Affordability is the wrong question. The right question is what do we prioritise? We could invest in the NHS and make it the best healthcare service in the world. In 2018 the Conservative led government agreed to accept the advice from the 'Naylor Review' which is an NHS asset stripping document commissioned by the DoH. Once again a few months later, in response to the Naylor review of NHS estate, the King's Fund published its report commissioned by the Department of Health in support of the Naylor Review. 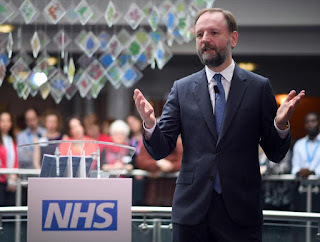 Twelve months earlier the King's Fund came out to support new U.S. style care models proposed by the head of NHS England Simon Stevens, a previous director of strategy at United Health, Americas largest private healthcare insurer. Healthcare and profit are a bad combination. Ask any of the 47 million non-elderly Americans that were uninsured in 2012. 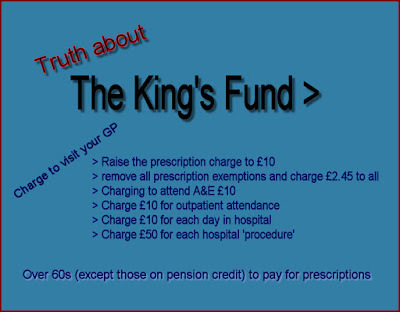 Kings Fund suggests NHS fees - but is it really 'independent'? If you live in the Morecambe Bay area or on the Fylde Coast then pay heed...All healthcare providers and commissioners in your area have agreed on a Memorandum of Understanding to set up a U.S. style Accountable Care System. Objectives: bring together (integrate) ALL health and care providers under a single partnership. Pool resources and demand manage [ration] health & care services and medicines. The Bay ACS will either “make or buy” (provide directly or commission) health and care services for the Bay population – a hybrid of commissioning and provider functions. With a focus on prevention [preventing patients accessing services] with increasing focus on community and getting people to take responsibility for their own health and wellbeing. ■ Demand management restricts patients’ choice. ■ ACS historically have incentives to only take healthier (i.e. more lucrative and less time-consuming) patients. ■ Capitation can encourage a doctor or practice to take on too many patients, more than they can ideally care for. ■ Over-treating: Capitated payments encourage doctors/practices to take on too many patients, more than they can ideally care for. Social care is currently means tested: when local authority care services are transferred to an ACS/ACO the means tests could then apply to both the 'care' and 'health' services elements. That is, patients could end up taking a means-test, and if their income is above a certain limit they'll have to pay for health services that were previously included as free on the NHS. ACS Scheme taken from U.S. Health Maintenance Organisations (HMO) and failed Obamacare model. 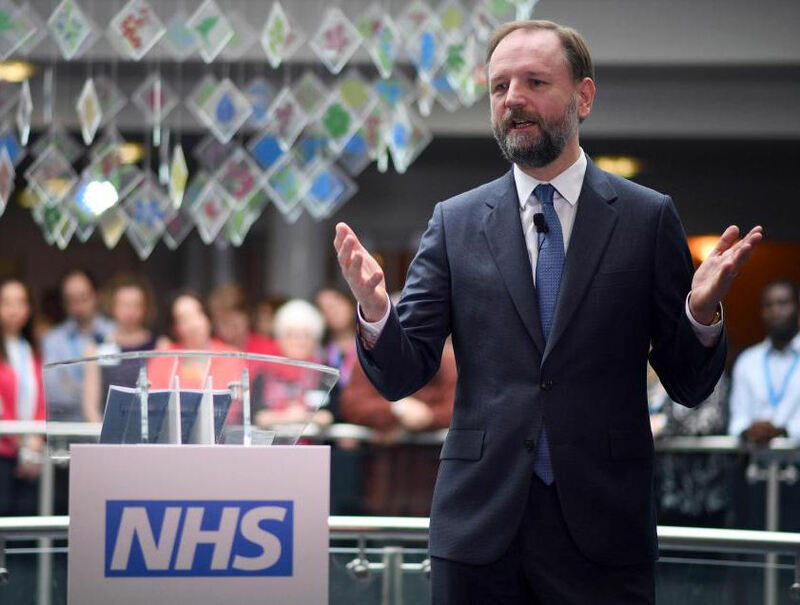 ACS Scheme being rolled out by NHS England's CEO Simon Stevens ex president of United Health - Americas largest private health insurer. scheme has full support and backing of health secretary Jeremy Hunt who in 2008 co-authored party policy pamphlet calling for NHS to be denationalised [privatised]. 2012 Health & Social (H&SC) Care bill introduced by the then health minister, Conservative minister Andrew Lansley opens up NHS market to any private [qualified] provider paving way for NHS privatisation. 2015 election - NHS England's five year forward view [FYFV] document for U.S. style healthcare shelved. England divided into 44 'footprint' areas with providers and commissioners in each footprint told to draw up a 'sustainability & transformation plan (STP) in line with five year forward view document. Providers and commissioners underfunded, unfair contract imposed on junior doctors; BMA mount weak opposition. 15 Jun 2017 - HEALTH bosses across the Fylde coast say they are 'delighted' to have been chosen as one of only a few areas in the country to receive support to progress towards being an accountable care system.